The San Vicente raised more questions than it answered. The biggest.. can THE FACTOR go the distance? The War Front colt jumped out of the gate, set blazing fractions, and just outlasted a charging SWAY AWAY by a length. 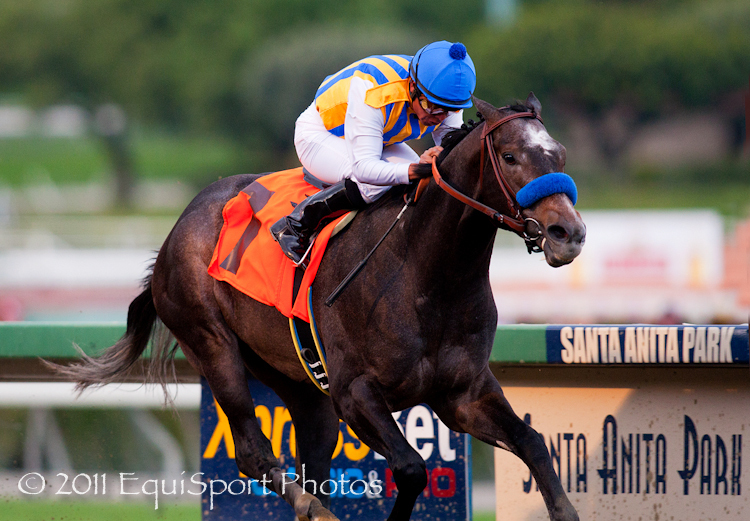 Trainer Bob Baffert's 'go to' rider, Martin Garcia, said of The Factor after the race "I just let him break by himself. The more you fight, the more he’s going to take off. He doesn’t want to be behind horses, so I just let him be comfortable and he kept going. He is still learning." The Factor, nearly collared by Sway Away at the wire, will have to rate off the pace if he's going to have enough gas to get the classic distance. Was SWAY AWAY, who moved from dead last to nearly catch the winner at the wire, perhaps the more impressive? Another sixteenth would have changed the outcome of this 7 furlong test. Sway Away, trained by Jeff Bonde, seems to be one to watch. And the Afleet Alex colt should have no trouble with the classic distance. “It’s heartbreaking to lose, but that’s the way the game goes. This horse is the best (Kentucky) Derby chance I’ve had in many years." said Bonde after the San Vicente. Sway Away is certainly is going on my Top 25. A few spots in front of The Factor... for now. MUCHO MACHO MAN finally prevailed, in his 4th stakes race, in the hard fought Risen Star Stakes (G2) at Fairgrounds Saturday. After finishing 4th last time out in the Holy Bull, this well traveled son of Macho Again beat a quality field including second place SANTIVA, and third place ROGUE ROMANCE. Mucho Macho Man. 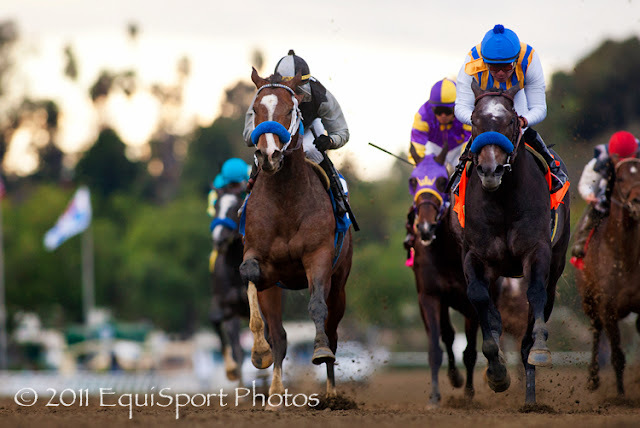 Photo: Joe Ganley/EquiSport Photos 1/1000 @ f/3.5, iso 800, 108mm. 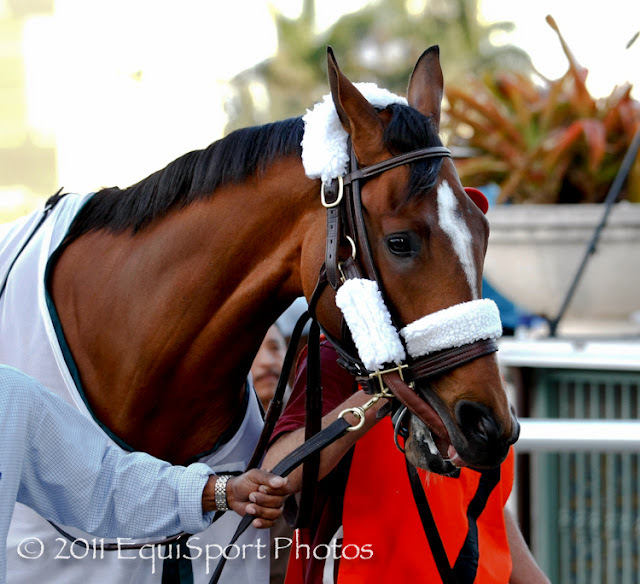 Mucho Macho Man also finished second in both the Nashua S. and Remson S. as a two-year-old for trainer Kathy Ritvo. “He goes two miles like he’s out to jog. He’s just going to get better the further the distances get,” Ritvo said. ARCHARCHARCH gritted out a tough win Monday in the Southwest Stakes, (G3) at Oaklawn Park, over a classy field. Highly respected JP'S GUSTO, the betting favorite, finished second in front of a fading ELITE ALEX. Jon Court rode the winner for his father-in-law, William 'Jinks' Fires. Coming out of the turn into the short Oaklawn stretch, the Arch colt responded when asked, opening up a 2 1/2 length lead on the field. JP's Gusto, ridden by Ramon Dominguez, got bottled up in the turn. “At the quarter pole, when I wanted to move, there were horses around me and I couldn't get out," Dominguez said.